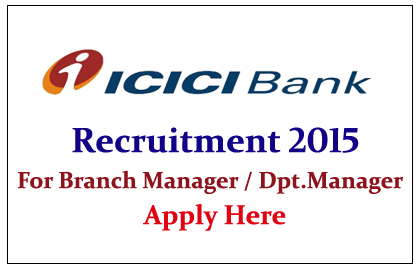 ICICI Bank is recruiting for the post of Branch Manager / Deputy Branch Manager for the year 2015. Interested and Eligible candidate can apply online. ICICI Bank is an Indian multinational banking and financial services company headquartered in Mumbai, Maharashtra, India. As of 2014 it is the second largest bank in India in terms of assets and market capitalization. It offers a wide range of banking products and financial services for corporate and retail customers through a variety of delivery channels and specialized subsidiaries in the areas of investment banking, life, non-life insurance, venture capital and asset management. To Enhance and Contribute in the Growth of the Company through Business Development, smooth flow of financial and non-financial transactions at the branch level, Revenue Generation, Profit and Cost Management, Customer Acquisition and Retention. Eligible candidates can apply online, for more details kindly check official Notification.